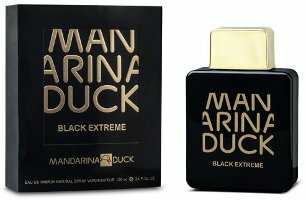 Mandarina Duck has launched Black Extreme, a new oriental fougère fragrance for men. Black Extreme follows the brand's Pure Black and Cool Black scents. Black Extreme was developed by perfumer Nathalie Lorson. The notes include bergamot, tangerine, pepper, tonka bean, orange blossom, tiare, sandalwood, vanilla and cedar. Mandarina Duck Black Extreme is available in 100 ml Eau de Parfum.